Reduced calorie sparkling drink made with Cotswold spring water and elderflowers. Only 17 Kcal (71kJ) per 100ml. Free from artificial colours, flavourings, sweeteners and preservatives. Suitable for vegetarians and vegans. 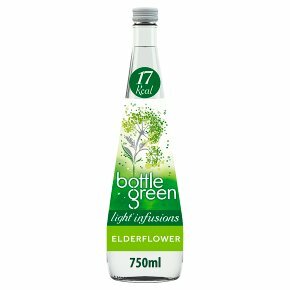 Light* infusions *contains at least 30% less calories than other regular elderflower based drinks. Refreshingly flavoursome & delicately light low calorie soft drink. Bottlegreen light infusions are a range of beautifully refreshing and delicately light soft drinks designed to enhance flavour while delivering a crisp taste experience. Contents under pressure, open with care pointing away from face.